Optimum Wound has a few other kindred spirits out there putting out amazing work online. Christian Krank is a lunatic mad fucker. And a very talented one as well. I first read Christian’s work last year when he contacted me on MySpace. His comic Destroy Dystopia is a truly sublime and engaging experience. 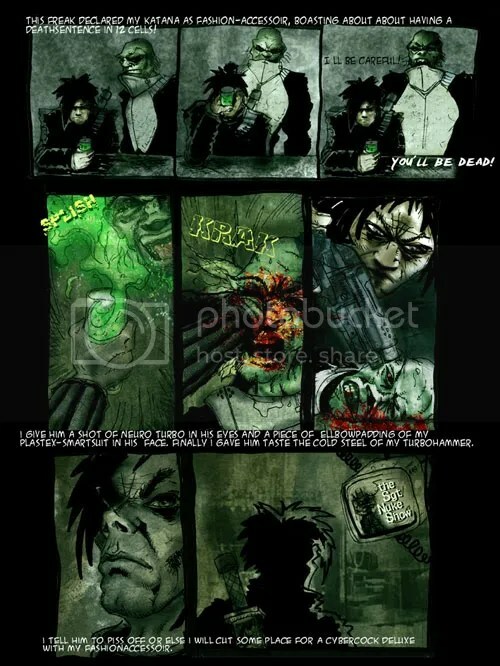 He mixed 17 million different elements into a blender and out came a psychotic new webcomic. Our friend Kenneth Ashcraft put a blurb on webcomicsnation.com stating: Killer art and badass story this comic takes the graphic novel to new levels!! A must read!! Inside and out, front to back; this comic is the best I have seen on the internet so far. It reminds of Cybernary from back in the day and a little Bladerunner plus something all new. Keep an eye one this one boys and girls, this comic is gonna hit the big-time!!! Christian is one of Dave McKean’s children. What I mean by that is Dave was one of the first to scan his drawings into the computer and then go to town with multiple layers of textures and Photoshop coloring underneath. Ashley Wood and Ben Templesmith employ techniques that are variations on this. And Christian is taking it into another direction altogether. If you dig cyberpunk, manga, ultra-violence, Judge Dredd, The Road Warrior, Bladerunner, Ghost In the Shell or just a mind-bending bloody trip through the future, Destroy Dystopia is your ticket. Take the ride. He’s got a shitload of pages posted. Pay attention to the backgrounds as he has a lot of things going on within each panel. You can find the man himself on MySpace. Look him up. He’s making us all up our game. Through his webcomic he ended up working with Clifford Meth and Rufus Dayglo as the colorist on the graphic novel Snaked for IDW Publishing. From there he continued on with Rufus on Tank Girl: Visions of Booga . Heâ€™s a hell of an artist. Gotta drink me one of those Neuro Turbos someday.